In our fast paced motorized society I invite you to join me in a counter cultural act: Take off your shoes, wiggle your toes in the grass or sand and walk. 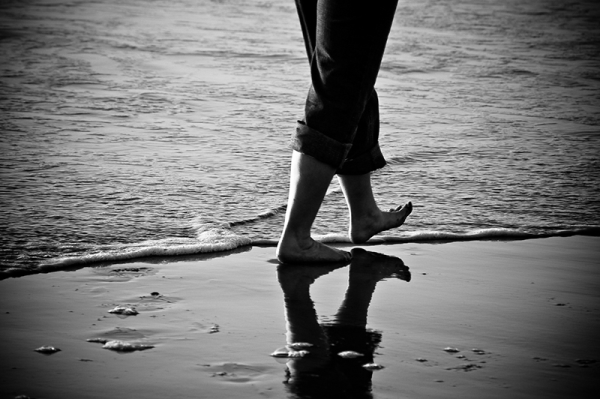 Walking and walking barefoot in particular, has a way of heightening your senses and making you mindful of where you step. Thich Nhat Hanh, the Buddhist monk and mentor offers this: ‘The miracle is not to walk on water but on the earth.’ True. Walking slows us down and makes us aware of where we are. More than other modes of travel, walking invites us to experience what is immediately behind, around and in front. It is one thing to drive by a person in need, a very different experience to walk past. My friend Joe walked the Appalachian Trail from Georgia to Maine. Only by walking do you get in touch with your own dreams and longings. Only by walking can you receive ‘trail magic’, gifts left by strangers such as a cold beer in a stream or a chocolate bar tied to a branch. Only by walking can a stranger become a friend as you listen to each others story. This past Sunday several of us met in the woods to walk in silence. This was our Sabbath, to experience silence as we paused by a wetlands and listened to that which otherwise would have been masked by talk. Note: I lead mindful walks and contemplative paddle trips. Contact me for information on the next scheduled event. This summer 2015 the church I serve is hosting a study and sermon series based on Barbara Brown Taylor’s book, An Altar in the World. Go to church web site http://www.fbcbeverly.org for more info. Well written and thoughtful, as always. One of the things I enjoyed the most on the Appalachian trail was the times walking in the quiet of the woods, surrounded only by the sounds of nature and removed from the insanity of our hyper-speed day-today world. There are times when I wish I were still out there.